We write this with reference to the discussions the staff side had with you on 21st July, 2017,when the official side explained the various recommendations of the Allowances Committee and the Government's decisions thereon. It is however, our considered opinion that the said allowances committee did not consider various submissions made by the Staff side both orally and in writing especially on those allowances, which has a universal application. Had it been really addressed, the reduction in the transport allowance in the case of employees in the lower strata of hierarchy would not have happened. No justification had been advanced by the 7th CPC for the reduction of the House rent allowance rates by a universal 0.8 factor. The Committee has also not enlightened us as to how the said factor had been applied while making cosmetic changes in the rates. The Committee did not consider the following glaring and untenable and incorrect conclusions of the 7‘h CPC despite that the Staff Side pointed out it in their written submissions. (i) The house rent allowance is one such allowance which is not cost indexed. As on 1.1.2016, the date on which the pay was revised, the DA stood at 125%. What justification could be offered to reduce the rates by 0.8%is inexplicable. By deferring the date of revised allowance by 18 months, i.e. with effect from 1.7.2017, the Government has enormously gained financially. The actual financial outflow on account of the revision of pay and allowances has thus become less than even what was projected by the 7th CPC. The Committee should have known that on all previous occasions, where the date of effect of pay and allowances had differed, the Govt. had granted Interim Relief and merger of DA. No such decision had been taken by the Government, prior to the setting up of the 7th CPC. Even the precedence on which the committee wrongly relied upon, had been set aside by the Board of Arbitration, not once but twice. (ii) The cosmetic changes effected in the rates of HRA which is published to have benefited about 7.5 Iakhs employees is not correct but exaggerated. (iii) The Committee's decision to retain some of the department specific allowances was on the suggestion made by the concerned heads of departments. The Staff side view had not been considered at all. (iv) The Pension committee’s recommendation to reject Option No. 1 on the ground of infeasibility is further reflective of the attitude of the Government towards the employees and pensioners. On 30th June, 2016 the staff side had a meeting with the group of Ministers headed by Shri Rajnath Singh, the Honourable Home Minister, when an assurance was held out to revisit the computation of the Minimum wage and multiplication factor. We were informed that the Committee headed by you would consider as to how the assurance could be implemented. Despite three rounds of meeting with you, nothing tangible in this regard has happened. In our earlier submissions we had pointed out with facts and figures as to how the 7'h CPC erred in their computation of the Minimum wage and how could never be less than Rs.26000 as on 1.1.2016. We are afraid that the repetition thereof would not serve any purpose. However, as desired by you, we give hereunder certain glaring, iniquitous and unjustified factors, the rectification of which could be the least the Government could do while revisiting the computation of Minimum wage and multiplication factor. 2. The 7th CPC reduced the housing component by 4.5%. This was in line with the computation formula adopted by the 6tth CPC. Such reduction on the specious plea that Central Government employees are given HRA separately was ostensibly incorrect as the quantum of HRA provided for is insufficient to meet the expenses incurred by an individual employee for hiring an accommodation. The point however, we would like to mention is that the 7th CPC did not notice that the 6th CPC had increased / retained the rate of HRA whereas the 7th CPC for no valid reason reduced all the three rates by a uniform factor of 0.8. The said decision reduced the HRA in metro cities by 6% in classified cities by 4% and in unclassified towns by 2%. Averaging out to 4%. It must be in the fitness of things, that the unwarranted reduction of housing component is restored especially in the background of the Allowance Committee refusing to restore the erstwhile rates. The computation of the minimum wage if this correction is carried out would be as in annexure 2. The minimum wage would then work out to Rs. 20232 and the multiplication factor at 2.89. This is when the commodity price is taken not as the average for 12 months but the actual price as on 1.7.2015. 3. The Honourable Supreme Court had directed that 25% must be added to arrive at the actual minimum wage in order to enable the employees to meet out various social obligations. Children education was on of the minor components of the social obligations mentioned by Supreme Court. When the Supreme Court delivered its verdict, education in the country was in the public domain and was almost free up to the secondary level. The advent of the neo liberal economic policies, imparting education to the children has become one of the costly affairs. The reduction effected by the 7th CPC to the extent of 10% attributable to children education is totally unjustified and in our opinion even amounts to non adherence to the supreme Court directive in the matter. If this error is rectified, the Minimum wage would be Rs. 21873 (MF 3.12) , the commodity prices being Rs. 9885 (actual as on 17,2015) and would be Rs. Rs. 20391 if computation is done on the basis of the average of the commodity prices as was done by the 7thCPC. The MF In the said two cases would be 3.124 and 2.913 respectively. (See annexure 3 and 3A). 4. The 7th CPC has adopted the family at 3 Units. This is no doubt in consonance with Dr. Aykhroyd formula. The family is taken consisting of husband, wife and two children, value assigned being 1+,O.8,+O.6,+O.6. In the present day society to assign a lower value for women is a misplaced and outdated notion. The gender equality demands that the family unit must be taken at 3.2. ( 1+1+0.6+0.6) Two workings are given in Annexure 4 and 4A. In annexure 4 commodity price is what it should be i.e. the actual prices as on 1.7.2015 and in annexure4 A the same is what is taken by the 7th CPC. The minimum wage in Annexure 4 shall be Rs. 19981 (MF2.94) and in the latter case the MW shall be Rs. 19193 and the MF at 2.74) Please see annexure 4 and 4A for detailed working. The 6th CPC while formulating the Pay band and Grade pay system had applied varying multiplication factors to create the four pay bands. They had relied upon the same argument that the skilled workers are entitled to have better pay packets than the unskilled or semi skilled labourers. The 7th CPC has advocated the same theory to apply varying Multiplications factors for creating pay levels. The successive application of different multiplication factors has disturbed the vertical relativity and if this theory is perennially adopted in the construction of pay scales the present equilibrium will be drastically altered. The ratio between the minimum and maximum pay in Government sector has been widening ever since the 5th CPC recommendations were adopted. The 7th CPC has relied upon the private sector wage pattern for justifying this practice. On quite a number of occasions, the previous Pay Commissions had advocated against the wage determination in Government and Public Sector on the basis of the fair wage comparison with the private sector as the functions and assigned responsibilities and objectives are essentially incomparable. Large scale contractorisation and outsourcing have already come into stay in Governmental organizations with consequent suppression of wages at the levels of semi skilled and unskilled levels. We are not presently on the ethical aspect of this unfair practice, which a welfare Government ought not have indulged in. We are to state that by application of different multiplication factors (i.e. Upto pay level 5 =2.57, pay level 6-9=2.62,Level 10-13A=2.67, Level 14-16 =2.72,Level 18:2.78 and level 17:2.81. By applying the multiplication factor at 2.81 for the Secretary level officers, the 7th CPC tacitly admitted that the minimum wage should not have been less than Rs. 19670. (i.e. 2.81 x 7000 = 19670) In this connection we would also like to bring to you notice that the Government has now unilaterally altered the multiplication factor and Pay matrix in respect of Level 13 from 2.57 to 2.67. Assigning a lower multiplication factor to the officers of level 13 appears to be a conscious decision of the 7th CPC as the Government’s executive order in 2008 to place the staid level of officers at a higher level had disturbed the then existing vertical relativity in the Governmental hierarchy. It is, therefore, the considered opinion and suggestion of the staff side that the Government must come forward to apply the uniform multiplication factor of 2.81 at all levels both for the construction of the pay levels as also for the pay fixation in the new Pay levels for the existing employees. If our suggestion is accepted, the Minimum wage would be raised to Rs. 19670 with the multiplication factor at 2.81. We request you to kindly convene a meeting of the staff side to cause discussions on the above submissions and arrive at a mutually acceptable conclusion. Jcm ko abhi yaad aya? Jab Rona Tha tab to roye nehin, ab rone se Kya hoga? Yeh sab dikhawa Hai. 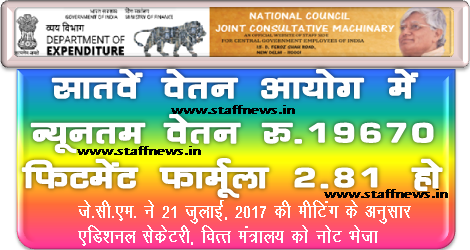 Increase in 7th CPC minimum pay and fitment formula - Note Submitted by JCM National Council staff side to senior officers committee headed by Shri Pramod Kumar Das, Additional Secretary, Ministry of Finance, Department of Expenditure on 14th August 2017.Increase in 7th CPC minimum pay and fitment formula with justification for higher HRA and revival of abolished Allowances- Note Submitted by JCM National Council staff side to senior officers committee headed by Shri Pramod Kumar Das, Additional Secretary, Ministry of Finance, Department of Expenditure on 14th August 2017.